Tomatillos add a touch of tartness and a pretty green color to a mild, spicy chicken soup with hominy. Ready to eat in minutes, top it with your favorite enchilada toppings. I asked my husband to go to Costco and pick up some groceries and grab something for dinner. He came home with ingredients to make a Lemon Cream Sauce, four cheese chicken raviolis, and a roasted chicken. We ate the ravioli with the cream sauce and pressure cooker steam carrots the first night, which left the roasted chicken for dinner the next night. While he was at Costco, my Instant Pot was delivered! So of course I had to cook something with the chicken in the Instant Pot. Luckily, I remembered a chicken tomatillo soup recipe in the Café Zupas Blogger’s Annual Cookbook that I’d been wanting to make. An Instant Pot is one of the most popular brands of electric pressure cookers. 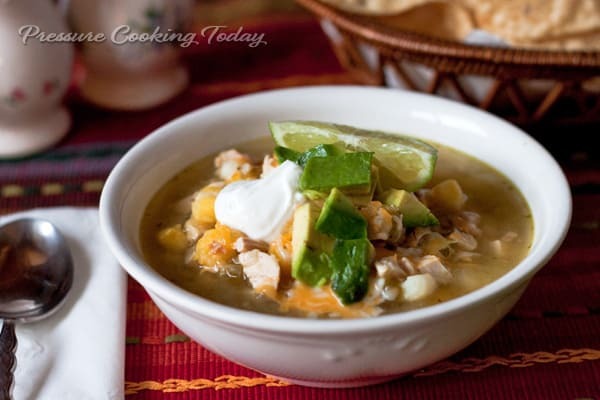 They are easy to use and your Instant Pot can help you create this delicious Chicken Tomatillo Soup with Hominy! The Instant Pot has a Soup setting that simmers soups at a slightly gentler temperature, so I used the soup setting adjusted to low for this soup since the ingredients were already all cooked. I made several changes to the recipe besides changing it in to a pressure cooker recipe. I changed the spices and used canned tomatillos. If you want to use fresh tomatillos, you should saute them with the onion and garlic. 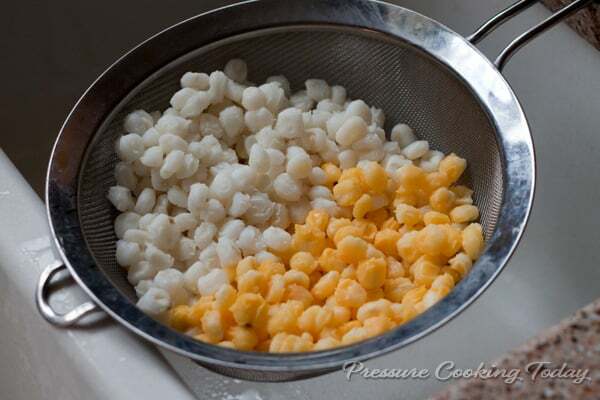 Hominy is kernels of corn that have been soaked in lye. They’re a good source of fiber and help make this a hearty, filling and delicious soup. Don’t skimp on the toppings. My husband wasn’t sure about topping soup with avocado, but loved it on this soup. Enjoy! Select Sauté and add the oil to the pressure cooker pot. When oil is hot, add the onion and cook, stirring occasionally until the onion is tender, about 5 minutes. Add the garlic and cook for an additional minute. Add the remaining ingredients. Lock lid in place, select High Pressure, 5 minutes cook time and press start. (You can also use the Soup setting in the Instant Pot adjust for less time.) It will take about 20 minutes to come to pressure because there is so much liquid. When timer beeps, turn off pressure cooker, wait 5 minutes, then do a quick pressure release. Barbara, thank you for giving us such a flavorful and satisfying soup! I just made this soup for the second time and put it on my Favorites list. The first time I made it I substituted 1 pound of fresh tomatillos (coarsely chopped) and found the soup much too tart. Next time I will probably reduce the amount of fresh tomatillos to 12 ounces. This time, while I was prepping the rest of the ingredients, I charred a pound of fresh tomatillos under the broiler of my toaster oven and absolutely loved the flavor that they brought to the soup. I’m finding that the tart flavor has been quickly growing on me and if I don’t get the leftovers into the freezer quickly I won’t have any left to freeze. Barbara, I haven’t used canned tomatillos before. I would like to make this into a Pantry Soup by using the canned tomatillos as you do. Do you think that these will take a char (as mentioned above) in spite of being so wet? Thanks Rita! They’re pretty wet in the can so they’d probably have to dry out to char, so I’m not sure you’d get the result you’re looking for. It does sound like a great flavor boost. Hi Aunt Barbara! I stopped over to a friends house for lunch today. She had her pressure cooker going and it smelled divine! She ladeled out this delicious soup! I was like.. Oh my gosh! This is so good! She said thanks! It’s from your Aunts website!! So full of flavor, hearty and delicious! Such a fun coincidence. Thanks for sharing Brandie! We love this one too. Barbara, i am making this tonight. Did I miss your topping suggestions? Anything else besides chopped avocado and cilantro? 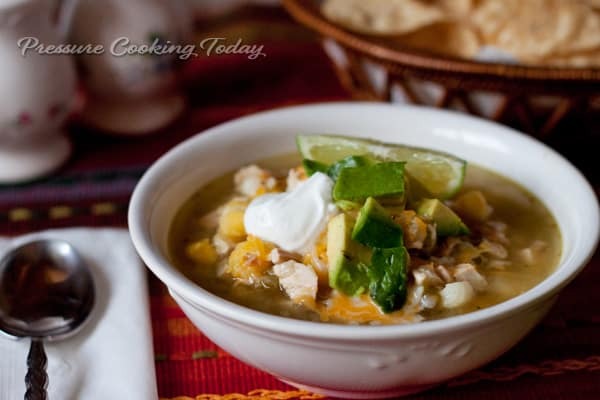 Hi Rita – any topping that you like on a chicken tortilla or taco soup would work well with this soup. Tortilla strips, sour cream, a little shredded cheese would all be great as well. Enjoy! I saw. I chopped. I pressured. Awesome! What a great recipe. Probably among the top 5 soups I’ve ever eaten….much less cooked. I have made this recipe numerous times for my family and we all love it. It is easy, flavorful, and typically have all the ingredients on hand. In a pinch, I have used grape apple juice and there is no difference in taste. This soup is great. It benefits hugely though from an overnight in the fridge. The flavors really come together. I’ve made this delicious soup several times. After the second try, I swapped bottled salsa verde for mild, canned green chiles (Lucky carries it) and the result is spectacular and much “cleaner” and fresher tasting than using salsa verde with all the binders/thickeners. Brava! This soup is a winner! Thanks Jennifer – I’m glad you enjoy the soup. Thanks for sharing your suggestion. I’ll have to give it a try. Barbara, how big is the can of tomatillos? I am not able to get them canned often. I don’t know why, the stores carry all kinds of other canned Mexican things. I can sometimes get them fresh but not always. I’ve even checked the Mexican stores locally without much success. And I love tomatillos. So I have looked for canned so as to always have them when I need them. Once I found the big 28 ounce but last time I looked I was only able to get 15 ounce cans. I make a green chili with pork that satisfies my craving for them but your soup sounds good too so I want to try it. You could really use either the 15 ounce or the 28 ounce in the soup. I used a 28 ounce can because that’s all the stores around here seem to carry. Winco in our area has the best selection, the others are hit and miss on tomatillos. It’s a great soup. I’m sure you’ll enjoy it. Barbara, this soup sounds amazing! Our family always enjoys a hearty soup on Christmas Eve and I’ve been searching for a new recipe for our special meal. Here it is the day before Christmas Eve and I do not own a pressure cooker (nor can I run out to buy one at this time). Do you have any suggestions how to adjust the directions for stove top or slow cooker? I’d be so grateful for your help…Merry Christmas. Hi Wendy – I adapted the recipe from this stove top recipe http://www.armelleblog.com/2009/03/chicken-tomatillo-soup-with-hominy.html. It would be a wonderful soup for Christmas Eve. Merry Christmas! Thank you, Barbara! I can’t wait to try it. LOVE using hominy! I have been searching for good hominy recipes. Thanks! This recipe was a hit! Really delicious. Thanks for letting me know you made it Elizabeth. So glad you enjoyed it. I’m new to pressure cooking so I’m hoping you can explain why you would need to pre-cook the chicken. It’s cut into small bite-size pieces and it seems to me that it would cook perfectly in 5 minutes under high pressure and then slow release. Am I wrong? Hi Debbie – you’re right. I haven’t tried uncooked chicken in this recipe, but there isn’t any reason you couldn’t use it. I would probably brown the chicken before cooking the onion, but browning would just add more flavor and isn’t necessary. One of the reasons I used cooked chicken was because I’d recently done a post on Cooking Chicken for the Week in 22 minutes. http://www.pressurecookingtoday.com/2012/12/cooking-chicken-for-the-week-in-22-minutes/. Also, I believe the original recipe called for cooked chicken. Thanks for the great question! Please let me know if you give it a try. Hi Barbara, i like your website very much and you have excellent recipes. I would love you to try this same chicken tomatillo soup with beef broth instead of chicken broth the taste is just incredibly wonderful. Hi Aida – Thanks for the suggestion. I’d love to give it a try. Do you use chicken with the beef broth or beef instead? Hi Barbara, nice to hear from you so soon, thank you. I make my own beef broth very simple as a compliment to a lot of foods. Here in Mexico we make almost all foods with this kind of broth and we use a lot of different chilies to make hot soups, if you would like some of my own recipes please just tell me what would you like to eat tomorrow ? and i will send them to you, I am not a chef but a little professional, some times I use to make banquets just for my children’s Wedding commitments or some parties for up to 200 people,normal gourmet Mexican and International food and Kosher too. Not any more for now until my grandchildren will be 13 years old they are triplets and they have now 10 years. The older one is 25 but it is a boy so who knows when he will get married. Anything you like please don’t hesitate to ask for. It will be a pleasure to help you with some delights that i make, the only bath thing is I do not have measures you understand me, I’m an older woman raised from European parents and lived all my life in Mexico City. Waiting to hear from you soon and from your fans also if i can help with some tips for your pressure pot as i use it every day. Thank you for the recipe. I have yet to make beef broth, and hope to try it soon. Wow triplets that’s so exciting. Sounds like you have had a wonderful life. I would very much like for you to share a recipe(s) with me and my readers. Do you have a favorite that you would like to share? so glad you liked my recipe in the zupas cookbook! Hi Caroline – it’s a great combination of flavors. Thanks for sharing it. I’ve never tried hominy….I will be now! That soup looks so good. Thank you Barbara! Thanks Carol! I hope you like it as much as we do. I’m such a fan of hominy in soup and I just when I thought I had tried every one this tomatilla version shows up. Nice photo. Now if I can just get a pressure cooker, I’ll be set. Thanks Lea Ann! I’d love to hear about the other hominy soups. I love all of the little comments about your husband’s opinion. It confirms that I’m not the only cook in the world with a picky husband!! Oh, and to try new things.. SCANDALOUS! !